Finally back to brewing big batches outside! Another long, miserable Chicago winter is in the books and it was wonderful to be back outdoors making beer again! This batch is a big one for me as it’s the first beer I plan on kegging. It’ll be a new process for me, and I’ve already thought of some things I’d like to try for next time like a closed transfer system. I’m anxious to see how my hoppy beers hold up compared to being bottled, though I’m sure I’ll still need to dial in my process. I’ve been wanting to brew this beer for a little while now, and I though my first kegged beer would be the right opportunity. 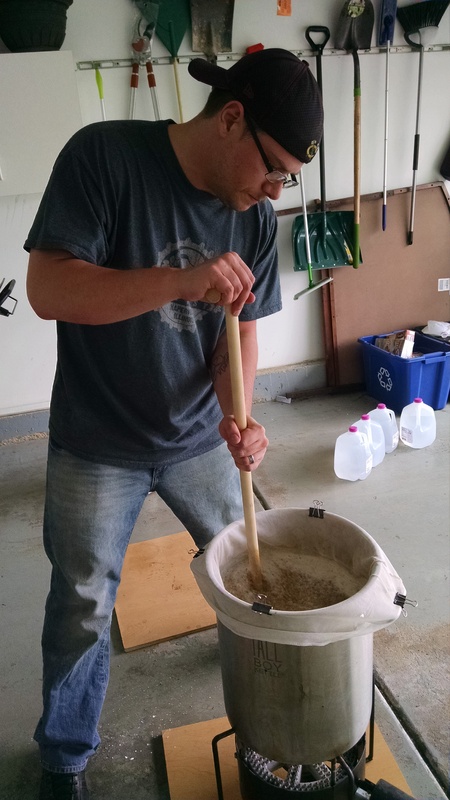 I looked back at this blog and saw that I hadn’t brewed a regular American IPA in about a year. Since that time, I’ve had some IPA’s that have blown me away, but I loved two in particular that I wanted to emulate; The Alchemist Focal Banger and Surly Todd the Axeman. These two beers have a decent amount in common, mainly that they are hopped with Citra and Mosaic hops, UK base malts, and a yeast with some character. 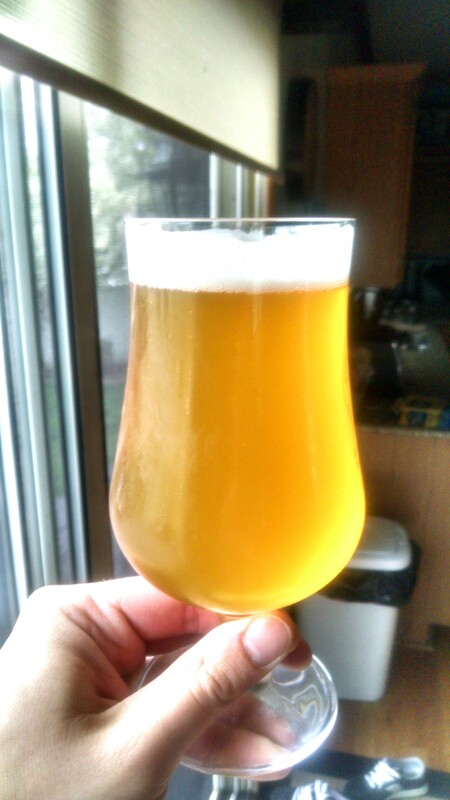 In designing this beer I used some of what has worked in my White Death DIPA. I chose Pearl for the base malt, Conan for the yeast, and some wheat and caramalt for body and character. I had some Apollo around for bittering, and then loaded up on the Citra and Mosaic. To be honest though, I wish I went a bit heavier on the hops. My LHBS only had two ounces left of Mosaic, so I had to skimp a bit on brew day. I had to pick up another two ounces a couple days later for the dry hop. I love the flavor and aroma that the combination of Mosaic and Citra have. Its citrus, tropical, and bit dank. I love Simcoe with these two hops as well, but I figured I’d keep it simpler for this batch. The brew day itself had ups and downs as they all seem to do. I like to use two brewing software tools. Beersmith and Brewtoad. I’m still dialing in my equipment profile on Beersmith as there are a ton of variables, but I like the simplicity of the mash and sparge calculator on Brewtoad. I tend to use the sparge volume from Brewtoad rather then Beersmith, but Brewtoad wasn’t loading for me on Sunday. The sparge volume in Beersmith seemed a bit high, but I followed it, and I undershot my OG at the end of the day by a few points because of the increased volume. Nothing a bit of DME couldn’t fix, but I should have known that was too much sparge water. I feel like I got careless with the DME as well. I always boil it first to sanitize it, but I didn’t this time. I hope I don’t wind up regretting that! I also overshot my mash temp by two degrees. I was shooting for 150, but I wound up at 152. That’s not going to change things up too bad, and so far Conan has fermented well for me. I’m not too concerned about this beer not drying out. Another hiccup I hit was I chilled under the temperature I wanted to do my hop stand at. I underestimated how cold the outside hose water would be this time of year and it brought be down to 120 degrees in short order! I could have put it back on the burner, but I put the four ounces in and steeped them for 45 minutes. The reason for some of this is I get distracted, and sometimes a bit tipsy on brew days. My brew days tend to be social events too with friends and family, and I could probably pay a bit more attention to my process. All in all with my adjustments I hit my numbers, and I’m sure this beer will turn out good! The recipe below is what I brewed, but I wanted to add another oz of Mosaic at 10 minutes. As I said above, the LHBS only had two ounces of Mosaic. I’ll update this post as the beer progresses! 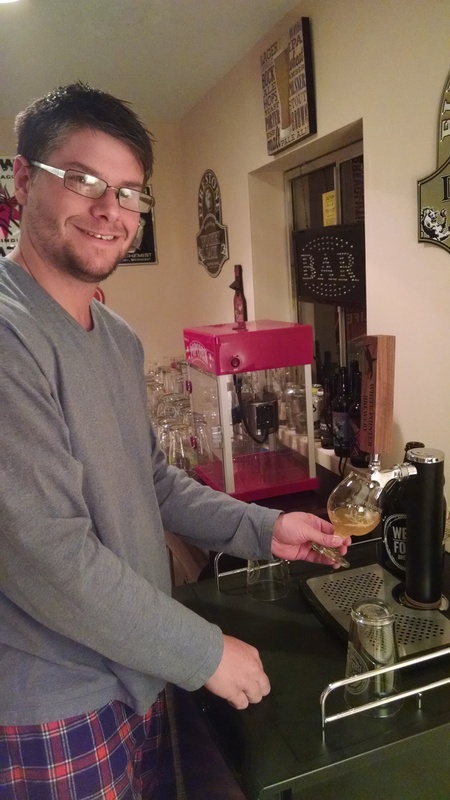 Update 04/22/15: The beer was transferred to a keg tonight! It feels great to finally be able to type those words. The beer was dry hopped in the keg. I tied two hop bags with 2 oz hops each with some unwaxed dental floss to the handles of the keg. The floss is thin enough that it doesn’t mess up the airtight seal. The hops will sit in there for 4 days, then I’ll pull them out and force carb. In less then a week I should be sampling my first kegged homebrew! The first pour from the kegerator! Tasting Notes 05/05/15: Hell yes. What a difference kegging makes in mouthfeel, aroma, and hop flavor. Appearance: Attack and Release pours a cloudy, slightly orange hued golden color. The beer has the typical appearance of the Northeast style IPA I based the beer on. The beer pours with a creamy, one finger sized head that lingers. Smell: Really nice aroma on this beer. Very hop forward with lots of fruity hop flavors such as citrus, peach, berry, and mango. The citrus in this is more orange than grapefruit. I love the peachy aroma that the esters from Conan yeast provide. Taste: Low bitterness, but good hop flavor. The flavor has developed and improved for the couple weeks its been in the keg, but I do think the cool hop stand failed to extract all the flavors from the late hops. I also wish I bumped the hop bill up a bit. The flavor is still good though. Lots of citrus, a bit of pineapple, some berry, and a bit of mango. The malt base has a nice bready quality, but the malt in this one is pretty subtle. Mouthfeel: This is one of the biggest improvements that kegging brought. The creamy texture of this beer is exactly what I wanted. Tons of lacing on the glass. Medium carbonation. The beer still finishes dry enough to make it very drinkable. Overall: I’m pretty satisfied with this one. I wanted to do a keg test run before doing a batch like White Death where I throw a wall of hops at it and this beer was great for that. Like I said above, I think I missed out on some flavor in the hop stand, and I think the overall hop bill needs to be bumped up. Next time I’ll move the late hops to five minutes, and double their amount. I’ll bump up the hop stand too. I’m happy with the flavors from this simple hop combo, and I’ll definitely brew this one again! 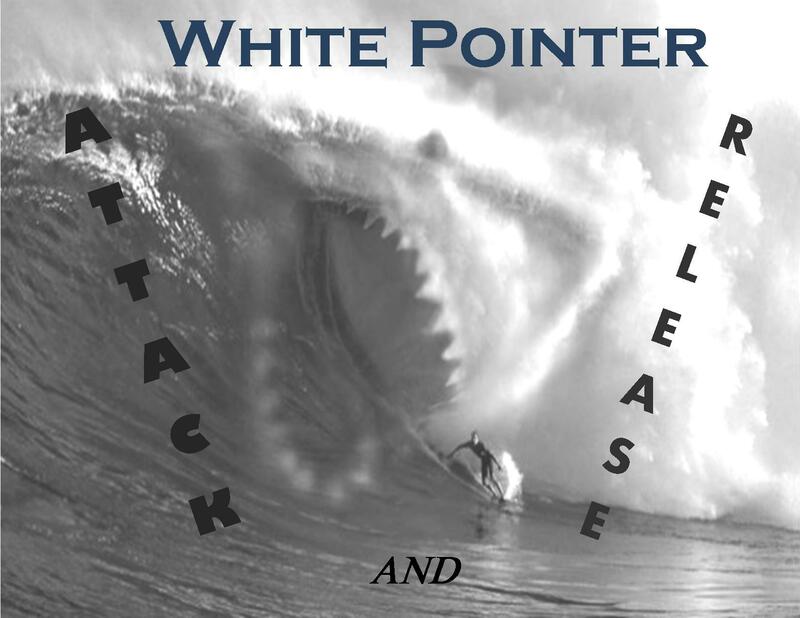 This entry was posted in Recipes and tagged Hoppy, IPA by White Pointer Brewery. Bookmark the permalink.